As always with these posts they DO CONTAIN SPOILERS. If you don't want to know what happened watch it, then come back to discuss. Back for another week, back for more PLL stress. So this week we saw the girls re renter an A type world with a new stalker (or potentially A) on the go with a new sign off, a devil. 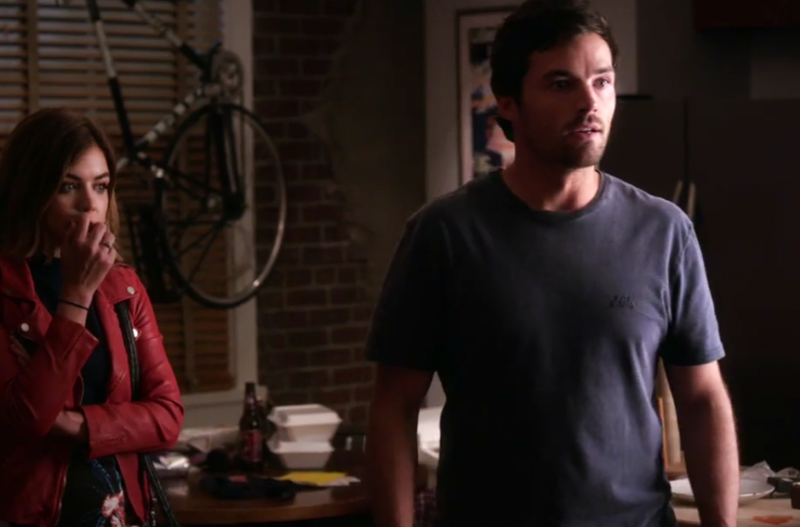 We found out what's really going on with Emily, Spencer and Caleb are a thing and Ezra lost all chill. Sarah really needs to leave. Surely she heard them discussing deleting the tape? Lucas is back?! Someone's done well for themselves. Don't talk about Haleb it hurts. Oh Spencer's been asked to lie? WHAT'S NEW? Melissa's still bitter about Wren then. Nothing more awkward than being declined a drink. Aria's shirt is jazzy, I like it. The world needs more jazzy shirts. Is this the start of dark Ezra? Good point, where is Ali? HONESTLY WHAT IS HAPPENING WITH EMILY? Okay she's not dying, we can relax. You carry on donating your eggs. I really don't understand Hannah's outfit... is that a dressing gown? I hate the writers for this. Stop making Spencer and Caleb a thing. I can't watch I feel betrayed. CREEPY TEXTS. HERE WE GO AGAIN. I need next week's episode now. Did you watch? Do you think this is A or a new stalker? RIGHT? I had the exact same realisation!